What I love about this salad is the colors – green and orange and yellow – so summery, so fresh, so appetizing. They are colors you want to wear all summer to stay cool and feel beautiful. With the zing of lime and a touch of herbs – use mint if you don’t like cilantro, or add basil if that’s what you’ve got too much of – it’s about the most refreshing thing you’ll eat. Serve with a rose or better yet a margarita, if, like me, you think a really good drink adds to the right meal. I like this with toasted naan. Oh, and if you have to have protein, try something grilled, but keep it simple. This salad doesn’t want crowding. You can find cooked, slightly salted edamame beans in 8 oz plastic tubs in the produce aisle of your supermarket. Or use frozen and cook it yourself. Adrienne demoed this for Brookside June 17, 2014, and again at USBG June 18, 2014. Serves two as a light main course, four sides. Remove the corn kernels from the cobs, you should have about two cups. Bring a pot of lightly salted water to a boil, add the corn kernels and cook about two minutes until al dente. Drain and rinse with cold water. Let the corn drain. 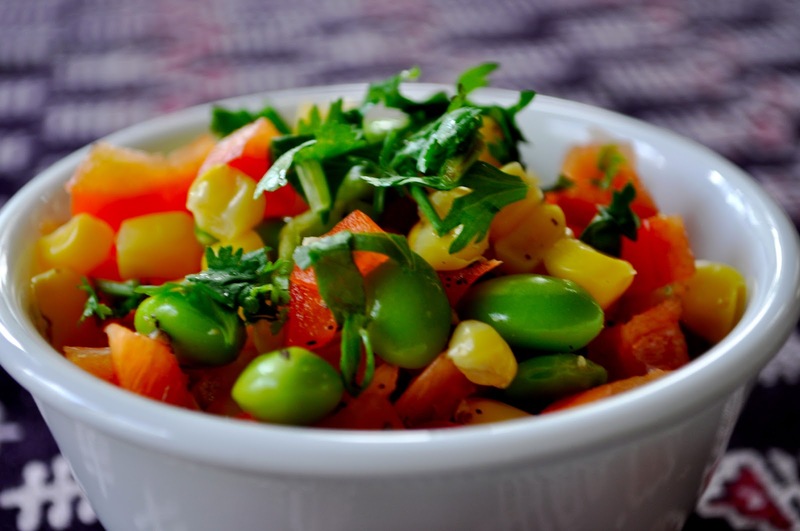 In a large bowl, mix the edamame and chopped bell pepper. Add lime juice, pepper flakes and olive oil. Add drained, cooled corn kernels. Toss well. You can refrigerate this at this point for a day or more. Just before serving, add chopped herbs, toss and taste, but you shouldn’t need anything more, . This entry was posted in Salads, Sides, Vegetarian and tagged basil, bell pepper, cilantro, corn, edamame, limes, mint. Bookmark the permalink.